Olive Green Embroidered Tallit including Embroidered Atara (Neckband). 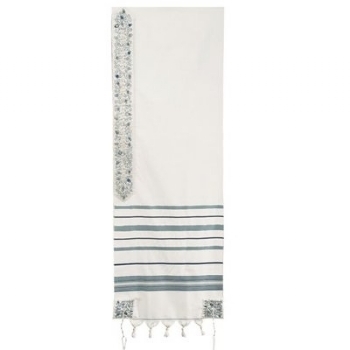 This beautiful tallit is ona woven wool base highlighted with gorgeous embroidered panels for the Atara (yoke) and four corners. The tallit features hand-woven stripes in coordinated shades of green. The olive green embroidery depicts the amazing Jerusalem landscape intertwined around the words of the traditional tallit blessing: “…asher kideshanu bemitzvotav vitzivanu lehitatef betzitzit” (to don the tzitzit ).